Nakiska - the Oceanside Townhome People Come Back to! Come and enjoying a relaxing family time ANYTIME OF THE YEAR! You will feel right at home in this beautiful FULLY-EQUIPPED, four bedroom, three bath Oceanside (not Oceanfront) townhouse. The first floor is comprised of three bedrooms, including one of the two masters (King bed) with its own bath, two additional bedrooms one with queen bed and the other with two twin beds, an additional full bath and full size washer and dryer. The stairs up lead to the Great Room, Dining area, fully equipped kitchen and the second of the two Master bedrooms (Queen). You will (I know we do) enjoy the fact that there is a deck off every room. Although not an Oceanfront unit you can still enjoy the sights and sounds of the beautiful ocean from the Oceanside decks. The street side decks afford a view of the marsh and intracoastal in the distance complete with spectular sunset views. Access to the beach is by private beach access. NO STREETS TO CROSS, simply walk across the courtyard/picnic area and you are there. The Surf City area is the 'commercial center' of Topsail Island and therefore offers access to many eating spots from burgers to gourmet. Other members of the family may enjoy the unique gift and other shops of interest. Sip your morning coffee, or evening glass of wine while you enjoy the sights and sounds of the Ocean in the foreground. We are confident that you will enjoy the Surf City area of Topsail Island and we hope you will want to return for years to come. Collect seashells, work on your tan to the envy of those left behind, swim or frolic in the inviting surf or simply enjoy the peaceful surroundings of this vacation paradise. Read a book, fly a kite, ride a bike or... DO NOTHING AT ALL! Read the comments of just some of our very satisfied guests and let us know if more information is needed. We LOVE TO WELCOME BACK OUR REPEAT GUESTS! My wife Barbara and I bought this town home in 2002. We are the first and only owners. We have enjoyed many happy times here and are excited to be able to share it with repeat and new guests. We actually had this on the VRBO rental market from 2004 until 2012 when we decided to move in ourselves and call it HOME. We enjoyed living at the beach for the two plus years we did however we are now going to offer for vacation once again effective spring 2015. We look forward to welcoming back our past guests, many of who have become friends and we look forward to making more! We have had a beach house in another area beach town but we are so pleased we finally chose Topsail Island and Surf City in Particular. The summer ocean temperatures are 'bath-like' it is truly a great swimming beach! It truly is a GREAT PLACE FOR A FAMILY VACATION! toilet, combination tub/shower, 1st floor. toilet, shower, 1st floor master bedroom. toilet, shower, 2nd floor master bath. Ocean side, no street to cross, simply a private 'courtyard' before the private beach access. Ocean side, NO STREET TO CROSS simply a private 'courtyard' before the private beach access. 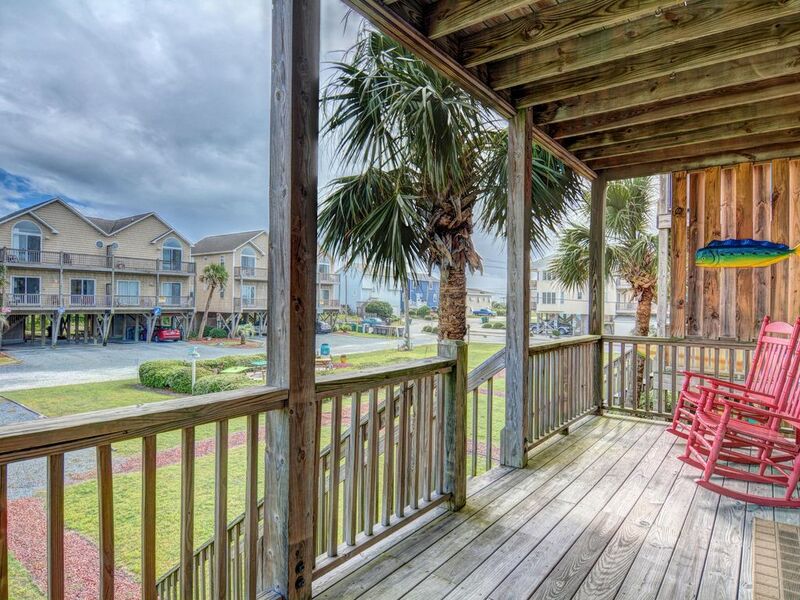 Views of the ocean as well as views of the intracoastal waterway in the distance from the streetside decks. Free Local and long Distance including calls to Canada and Puerto Rico. Samsung side by side with lower freezer and ice-maker. Above the stove, full size. Place setting for 10 PLUS. Fully equipped, everything you will need to contribute to a delightful beach week. 5 TV's, each bedroom and the Great Room. There are two DVD players. 1 is a Blu-Ray which allows for streaming video, upstairs in the great room. Cards and a few board games. Beach toys are available for your use. The inventory tends to change! Nearby - including North Shore Country Club a championship course in Snead's Ferry, a short 15 minute drive away. Amazing! Wonderful well appointed home away from home! Nakiska - Such a blessing after hurricane Florence! After our home was damaged by the hurricane we were lucky enough to find Richard's home during a moment of panic during the end of our family of 5's temporary hotel life. Like the sun after a storm so was this house. Richard is an amazing owner always willing to help if needed with any request or issue as well as just being available for any questions. His home, is your home. You immediately feel like you are home with everything. The kitchen is better appointed than my own home! I can only imagine how nice this home is to spend time at end the summer. You will not find many like this. Ample parking private beach access , attentive owner and very well appointed and taken care of. If I didn't live in the area I would vacation here regularly. I will be recommending this property to everyone I know looking for a beach rental. Richard thank you for opening your home to us for the past 3+ months is has been such a blessing! In closing a wonderful home you won't be disappointed in! Look no further! While cut short by Hurricane Florence, we loved our stay in Surf City at this property! It was bright, clean, and spacious- perfect for our family of 6. The beach was only steps away across a gravel courtyard. The house was well stocked, and we brought not much more than our personal belonging, sheets and towels. The owner, Richard, was great at communicating with us and frequently checked in on us during the evacuation. We look forward to staying here again! This was by far one of the best houses I have stayed at on Topsail or any other beach where I have vacationed. The house is decorated beautifully, was spotless upon our arrival and had everything we needed for a comfortable week. The kitchen is well stocked with plenty of dishes and utensils and every cooking item you may need. We brought our own beach chairs, boogey boards and umbrella, because in the past when houses said they had these items they were often found to be in disrepair and not suitable to use. However, the chairs and beach toys for use at the house were in great shape, and I could have saved some space by leaving mine at home. I don’t recall seeing a beach umbrella in the storage closet, but otherwise there was every item you could want. The location of the house is excellent. The walk to the beach is just over a small parking area and up the stairs and walkway to the beach. It’s a two minute walk to the sand which made it easy to carry chairs and other items to the beach. The location is also less than a mile to the shops in Surf City. We had a great week and I know that this is one house we will return to again! The last item of praise I have for Nakisha is the owner himself. The owner, Richard, was great to work with and even got in touch when we first arrived to make sure everything was in order at the house. Everything was in great shape, but I can tell he takes pride in his home and would have remedied any situation that was not right. He was truly a pleasure to rent from! A beautiful home that is so close to the ocean! Nakiska is a heavenly getaway. It is equipped with everything you need to make the vacation a great one. The beach is right across the parking lot. The owner is quick to respond to messages. I look forward to returning again some day. Richard was the perfect host and a great communicator. The townhouse is wonderfully located in Surf City, not far from the pier and bridge and center of activity. The home's layout provides excellent space for gathering of family and friends as well as private bedrooms for retiring from the activity. The beach is a short walk away along a private access. The kitchen is well-appointed and everything, absolutely everything, is clean and tidy and in tip-top shape. All reservations are subject to a $100.00 cancellation fee. Cancellations received more than 2 calendar months prior to arrival will be refunded in full less cancellation fee. Cancellations received within 2 calendar months of arrival ARE NON REFUNDABLE. Cancellation insurance is available through your travel agent or www.insuremytrip.com and others and IT IS HIGHLY RECOMMENDED. No refunds are made in the event of voluntary or mandatory evacuation orders. WE STRONGLY SUGGEST TRIP INSURANCE! PAY PAL and CREDIT CARD PAYMENTS AND ECHECK PAYMENTS MADE TO HOMEAWAY ARE SUBJECT TO A 3.0%% PAYMENT PROCESSING FEE which will be deducted from your security deposit at the end of your lease. Monthly rate is based on long term rental (off season only), 3 months or more. NO TAX ON LEASES MORE THAN 89 DAYS. Departure cleaning is included in rates. NOTE - Owner is a licensed Real Estate Agent in NC and PA. The quoted prices reflect direct bookings with owner paid by check or money order. Bookings made and/or paid for through VRBO are subject to a VRBO reservation fee and the credit card administrative handing fee outlined above.